Lotion is $5 for 4oz snap top bottle, $10 for 8oz snap top bottle, $20 for 16oz pump bottle. I do make several batches of goat milk soap and lotion each year. I generally have lavender (or other floral scent) and unscented on hand. I can take special scent or additive requests so long as they are paid for in advance. Soap takes about eight weeks notice to prepare and cure the bars. Lotion only requires a two week notice. 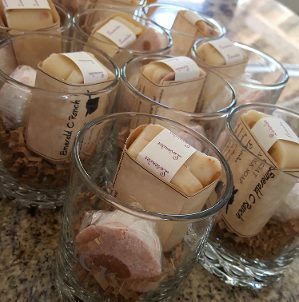 My base soap recipe won second place at the 2016 ADGA Convention's product competition, in the Unscented Fresh Goat Milk Soap class, and I've had several customers use my lotion and give positive reviews for relieving dry skin and other skin conditions. Give me an email if interested! If your in the area, we always have eggs available in a mix of colors (white, light brown, dark brown, blue, green) at $3 per dozen. Prices quoted are for animals picked up at the Emerald C Ranch, located near Gainesville, TX. Additional charges, including kennels, health certificates, additional testing, shipping costs, etc., are the responsibility of the buyer. We test the breeding herd annually for CAE and any new animals for CAE, CL and Johnes. A non-refundable $100 deposit will hold the animal of your choice, posted for sale, for one month. Payment must be made in full prior to receiving any animal (all checks must be cleared). Sales are final once the goat leaves the farm. Cash preferred, and REQUIRED if paying at pickup. If the buyer wishes to cancel or is unable to complete the sale prior to pickup, a refund, minus the deposit, will be given. The seller reserves the right to cancel a sale prior to pickup, for any reason, in which case a full refund of any payment, including the deposit, will be given. Changes to this agreement may be made on a case by case basis at the discretion of the seller. All animals are guaranteed healthy when they leave our ranch. We also guarantee fertility on breeding stock and will replace any infertile animal contingent upon receiving a veterinarian's statement that the infertility was genetic in origin and the animal received adequate care. Since we cannot control any stress that may occur as a result of shipping, or the animal's environment or management once it leaves our farm, we cannot offer further guarantees. Due to biosecurity concerns, we will not generally accept an animal back on the farm once it has left. However, we do wish you to be happy with your purchase and are willing to provide advice and assistance, where possible, with any issues you may encounter. Check our kidding schedule for recent and upcoming breedings! Sorry, we are unable to accommodate farm tours and do not have open hours. Please email us at emerald.c.ranch@gmail.com to setup an appointment to view and pickup sale animals. If you are interested in our animals or products, please contact us at emerald.c.ranch@gmail.com. Contact us at emerald.c.ranch@gmail.com. We are located in Gainesville, Texas near the Red River and about 1.5 hours north of the Dallas-Fort Worth metroplex.